The desire to travel has no correlation with positive impressions despite the travel industry’s ardent efforts to convince us otherwise. I’m often moved to action by emotional responses that would have the experts gnashing their teeth (in which I happen to take a bit of pride). National Geographic ran “The Emptied Prairie” in January 2008. From the title down, there was nothing on pages 140 - 157 that remotely resembled the enticingly glossed travel magazines in the same row of offerings that day in the book store. I could have been transported to any number of magical destinations, delivered there by the heady claims of paradise and rejuvenation, discovery and adventure. Instead, I plucked the mundane. The Emptied Prairie left me morose. 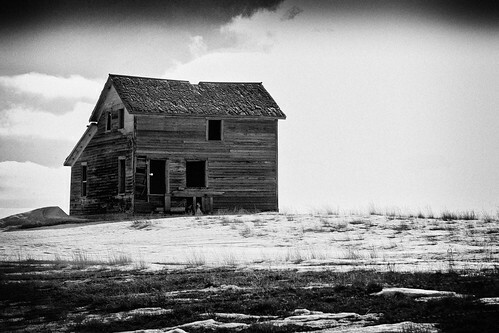 And hell-bent to see North Dakota exactly as Nat Geo had depicted it - gray, cold, forlorn. Our backgrounds dictate how we receive input and mine told me there was a “spin” on this story. I too live in a prairie state. Signs of human migration wrought from disappointment dot the landscape here as well. My hometown of Soper, Oklahoma has a population of 300; the High School serves 85 students. The town is in the most impoverished county in the state. On a gray, rainy day it too appears to be on its last leg and a sense of melancholy and abandonment strikes the bone.